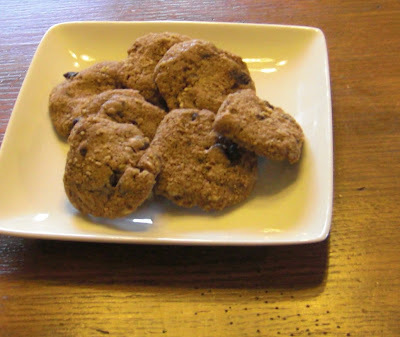 Here is another recipe for cookies without refined sugar. I am in charge of making the "cowboy cookies" each year for the rodeo. I decided to be true to my values and bake cookies I felt okay with my children eating. I made over 350 cookies. Including pumpkin raisin and pumpkin chocolate chip (always a fan favorite) and I devised a new recipe this year. While it isn't vegan like the Refined Sugar Free Choc-Oat Cookies, it is delicious. By popular demand I am posting the recipe. Combine all ingredients in mixer and mix well. Start with 2 cups of flour. Add more depending on moisture of the dough. You may want to bake a test cookie. Cook at 375 degrees for 9-11 minutes. I don;t remember feeling the texture of the oats and coconut. did you make them into flour? or was I not paying attention. I need to email you this cake recipe it is so good !! but I think it has dairy in it. I'm sure you can fine tune it!!! Yes, blend the oats and the coconut into as fine of flour as you can. Thanks for the cake recipe. In perfect time for Pip's birthday on Monday!